The topic of “Millennials in the workplace” has been discussed by business executives for almost a decade now, as employers began to appreciate that those born in the early 1980s to the mid-1990s had a significantly different approach to work than the typical Baby Boomer and Generation X employees. There are multiple schools of thought explaining the differences. One theory is that the generational differences are connected to how Millennials were raised. Their focus on teamwork began in the education system, encouraged by teachers who focused on group dynamics, where students were able to work together to achieve mutually agreed goals. Internet based technology has further encouraged group interactions with an always-on and constantly connected environment. Today, Millennials are not simply the topic of discussion, but are guiding the debate and making the decisions, still influenced by the important concepts of teamwork and anytime, anywhere connectivity. This is why Unified Communications as a Service (UCaaS) is a critical component for today’s workforce. Unified Communications has been created to enable better communication and collaboration throughout the working day, and this spans many different forms of communication, such as voice, video, text, instant messaging, and screen sharing, that Millennials want to use for interacting with fellow colleagues and clients. Putting this capability in the cloud provides even more opportunities for employees to share ideas and information, while giving them the flexibility to work where, how and when they want. Embedded Mobility: UCaaS allows Millennials to simply and effectively share information and collaborate with co-workers while giving them the flexibility to IM/chat over their lunch break, in the car or video conference from their home offices. BYOD: With UCaaS, companies are able to provide a single, converged technology set-up free of hardware constraints and device limitations. Bring your own device (BYOD) is convenient for employees, as they only have to manage one device, and it saves companies from investing in, protecting and updating multiple devices. Instant Response: UC elements like chat and presence, which displays employee availability on all devices, minimises unproductive time spent waiting for a response to an email or voicemail. Employees on calls with customers or in meetings can seek immediate assistance from their colleagues in seconds. CRM Access: The integration of CRM tools into a UCaaS service enables customer facing millennial employees to save valuable time by eliminating the need to manually create records of each customer engagement. This also means that employers have more accurate analytics on all customer interactions. Easier Telecommuting: Millennials are among some of the most likely workers to telecommute. 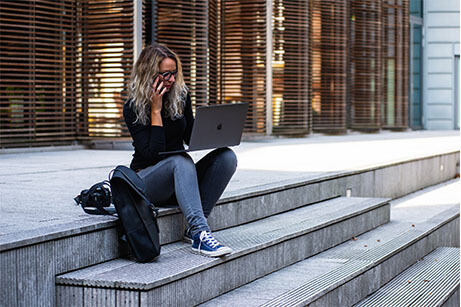 Working remotely can be an isolating experience, but UCaaS connectivity mitigates that isolation by ensuring that remote workers can access the same quality services that they’d use in the office. Punchier Communications: Raised with ubiquitous smartphone texting, Millennials prefer the power of short, sharp and consistent real-time communications over long emails or time-consuming phone calls. UCaaS can enable SMS and IM technology to cater for these preferences. To discuss Millennial employees with PGi, why not Register Free here for UC EXPO 2019?